The findings contained within this report are useful in informing the assessment, development, and implementation of Healthy People 2020. The variations in use reported above parallel the distinct and competing opinions regarding the organization of Healthy People and the number of focus areas and objectives that should be included in Healthy People 2020. In sum, there is no clear consensus from Healthy People 2010 users about how to organize Healthy People 2020, or how many areas to include within any organizational format. These findings mirror discussions that have occurred in the Healthy People 2020 Federal Interagency Workgroup, the Secretary’s Advisory Committee on Disease Prevention and Health Promotion Objective for 2020, and across the regional meetings hosted by ODPHP in 2008. Together these findings and discussions suggest that Healthy People is utilized by different people in different ways, and these differences make aspects of the initiative more or less useful depending on the audience. To serve the various needs of different stakeholder groups, Healthy People 2020 should be a dynamic initiative that enables users to continue having access to the aspects of the initiative that help them support movement towards meeting the national health goals. This conclusion supports the decision to develop Healthy People 2020 using a two-pronged approach which addresses risk factors and determinants of health, as well as specific conditions/disease areas. The results additionally support the development of a web-based format for Healthy People 2020, which will enable users to more easily link objectives, and connect to implementation strategies and evidence-based practices. Finally, increased and more efficient communication between HHS and Healthy People stakeholders could provide users with a more complete understanding of Healthy People and the tools it provides. From the follow-up discussions we found very little engagement in the development process for Healthy People 2020, even among the users of Healthy People 2010. Of the ten discussions that took place, only two spoke of participation in the Healthy People 2020 process, one of which was minimal (periodic notices through APHA). While this could be a call for increased communication and outreach efforts, HHS should be heartened to know that many of the changes they are pursuing for Healthy People 2020 are highly sought by the initiative’s key audiences. The MTAHB user explained “we find ourselves drawn more and more to environmental issues. We really like the Social Ecological Models. We talk about determinants of health, so I think everybody would like to see a broader emphasis that way.” A local user stated that “the whole emphasis on social determinants of health is really taking off in our community. People are really starting to see connections, and anything 2020 can do to support that would be great.” Additionally, a local non-user of Healthy People 2010 requested a disaster preparation and management area of focus, to support his organization/agency’s work in that area. HHS is already working to include, and even emphasize these areas in Healthy People 2020, though more outreach may be needed to inform key audiences of these updates. 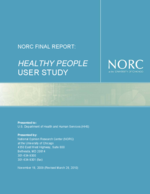 The study results indicate the importance of building on past Healthy People iterations and demonstrate that within all organization/agency types, both users and non-users have an interest and a willingness to work with HHS to bring about even greater implementation of the Healthy People 2010 and Healthy People 2020 initiatives.